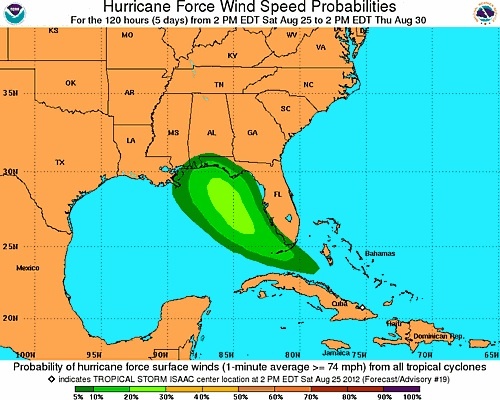 Officials in Miami are urging residents and tourists not to take tropical Storm Isaac lightly. They say the time to prepare is now. Hurricane Isaac is currently moving along the northern coast of Cuba and should move near or over eastern & central Cuba by Saturday night and near or over the Florida Keys & southern Florida Sunday or Sunday night. A Hurricane Warning is in effect for the Florida Keys and parts of the west coast of Florida, with Hurricane Watches and Tropical Storm Watches and Warnings in effect for other parts of Florida. OF MONROE COUNTY AND ADJACENT COASTAL WATERS. MORNING…WITH HURRICANE CONDITIONS POSSIBLE SUNDAY AFTERNOON. A LOCAL STATE OF EMERGENCY FOR MONROE COUNTY HAS BEEN DECLARED. PREPARATIONS FOR THE PROTECTION OF LIFE AND PROPERTY SHOULD BE COMPLETED. SMALL CRAFT SHOULD REMAIN IN PORT. ARE STRONGLY RECOMMENDED TO GO TO A SHELTER FOR YOUR OWN SAFETY. THROUGH SUNDAY. MARATHON AIRPORT IS CLOSED. WILL BE CLOSED ON MONDAY. SHELTERS. CITY OF KEY WEST OFFICES WILL BE CLOSED ON MONDAY. SURGE SECTION FOR SOUTHWEST COAST. LOCATIONS AND COASTAL WATER LEGS OF SOUTH FLORIDA. COASTAL COLLIER…MAINLAND MONROE AND FAR SOUTH MIAMI DADE. ALL OF THE ATLANTIC WATERS AND LAKE OKEECHOBEE. RESPONSIBLE FOR AT GREATER RISK. REALIZED IT WOULD MATERIALIZE WITHIN 18 TO 30 HOURS FROM NOW. WATCH WILL LIKELY BE NEEDED FOR ALL OF SOUTH FLORIDA BY SUNDAY. BEACH EROSION ALONG THE GULF AND ATLANTIC BEACHES. VULNERABLE TO HIGH WINDS OR FLOODING. SHOULD REMAIN IN PORT AND WELL SECURED. AND LISTEN FOR POSSIBLE WARNINGS. BEST STRATEGY FOR SECURING YOUR CRAFT. OR YOUR COUNTY EMERGENCY MANAGEMENT WEB SITE.